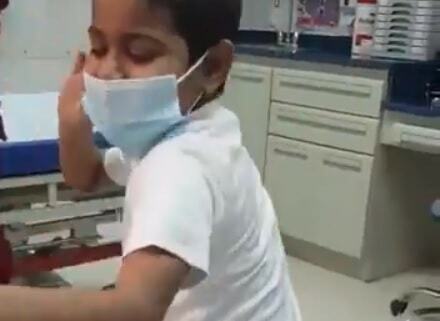 - In the viral video, Saudi boy wearing a face mask and dancing inside a hospital room, The video was posted by the Saudi Ministry of Health on its twitter account. The video has gained attraction not only from Saudi Arabia but also from other Arab countries. - According to Ministry of Health tweet, "With innocence and happiness, the boy Saif asked his doctor to spread his video for more and more likes". The words were expressed from the boy's heart, after he realized that there will be no more sessions and that his kidney transplant has been a success". الطفل سيف يقول : " انشر الفيديو يادكتور في كل القروبات أبي لايكات كثير". كلمات قالها من القلب..بعد أن هجر غرف الغسيل ونجحت عملية "زراعة كلى" له بفضل الله في مستشفى الملك فهد التخصصي في #الدمام.